"The gun muzzle presses against my neck." Clayton Stone is a 7th grader attending a private school in DC where he is an average student and decent lacrosse player. He lives with his Gran who runs a diner, that is, until she is recalled from retirement by the President of the United States to reprise her role as the "Chief" of the Special Service. A Senator's wife and his daughter have been missing for a week, and other mall nappings are occurring. Clayton mistakenly overhears the phone call and soon finds himself pulled into the stake-out. Sure, it messes with his lacrosse schedule, and he hates keeping the real reason he's missing practices from his team, but he seems to have it in his blood. Plus, he loves the SpiPhone and other fun gadgets he gets to use. He does not, however, like the feeling of a gun muzzle against his neck. The struggle to balance school and his new calling is something in which Clayton must come to terms as he almost single handedly solves the mystery behind the kidnappings. Each short chapter is headed by a date and timeline. Told in 1st person, the fast pace will appeal to middle grade readers, especially young boys who dream of their own James Bond adventures. When you get down to it, this is a story about loyalty to friends and family, with family including teammates of both the lacrosse and espionage sort. As much as I enjoyed this book, I had to pause when Clayton both drove a car (which is hardly believable due to Washington DC traffic) and used a gun without training in either one. He, on more than one occasion, ignored specific instructions in the pursuit of saving the public and adding suspense to the story. I would have preferred he stuck to cool gadgets as used throughout the rest of the book. I know many parents will reject the book due to these issues. Also, there is some language that may offend some. Still I would recommend this book to readers aged 10-12, especially reluctant readers, who enjoy lots of action. It is different from other spy novels for young readers and full of fun characters. This book will be available July 30th. This story takes place in 1870 Victorian England. “Birdie” McAdam is a small girl for her 10 years and has a beautiful singing voice. She helps Mr. Alfred Bunce who is a bogler. He catches and kills bogles that eat little children. Birdie acts as bait by singing songs to coax bogles out of their hiding places. Birdie is the best apprentice Mr. Bunce has ever had. She never makes a mistake. He’s lost one boy before and he doesn’t ever want to lose another to a bogle. Birdie loves her job and she is treated well, and together they earn a good, honest living. Soon they are approached by a questionable woman who does not run quite as honest a business as they, who complains of her “boys” have gone missing. They are orphans who pick pockets for her. One has a crush on Birdie, but Alfred has warned her to "stay away from them that don’t work an honest living." Then enters Miss. Eames, who is researching local folklore and is very interested in their business. She would like to join them to see what they do, since she doesn’t entirely believe in bogles. She and her elderly aunt are well-to-do and after hearing Birdie sing would like to take her in and provide her with singing lessons, as well as give her all the other accoutrements of a wealthy lifestyle. Birdie cannot imagine leaving Alfred. He needs her to sustain his business. When Alfred and Birdie are called to help join in a mission to break in a house to rid it of a bogle, and help rescue a missing boy, they include Miss Eames. The bogle is killed but end up infuriating a man who is worse than any bogle. The house belongs to a doctor who has figured out how to catch bogles using the young boys for bait. He desires increased power by keeping a bogle. When he realizes Alfred has killed his bogle he retaliates by kidnapping Birdie. At this point the terror and suspense is scarier than when they are catching bogles. There is a satisfying ending when Birdie finally agrees to live with Miss Eames, although she still helps Alfred on the side as he experiments with new ways to catch bogles. This is the first in a trilogy. Although good on its own, I can imagine the next book will provide another adventure and twist the plot even further. Good for grades 4-7 who enjoy suspense in a realistic fantasy. 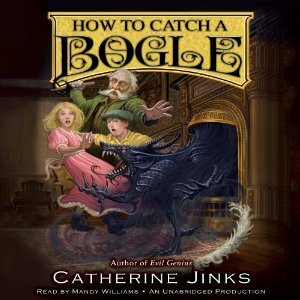 Mandy Williams is very good as the narrator, but sometimes the British accent is hard to understand and there were words I was not familiar with. Though the book has a glossary, the audio does not, so readers may want to check the hardcover for definitions when confused. In this regard, the book may be better to read than to listen to as an audiobook. This won the 2009 Newbery Award. The book begins with a triple murder leaving a baby orphaned. He toddles across the street into a graveyard where he is adopted by a community of ghosts. Mr. and Mrs. Owens claim him as their son and name him Nobody, or Bod for short. Silas becomes his guardian due to his ability to leave the graveyard and thus provide Bod with food and other necessities. Other ghosts take on the role as teachers and tell him about the real way historical events occurred. 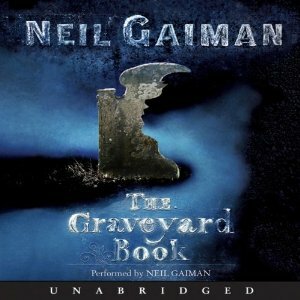 He is given Freedom of the Graveyard where he learns to Fade and how to stay protected within the gates of the graveyard. Outside the gates, "Jack" still hunts for the baby he failed to kill. In each chapter, Bod learns another lesson, mostly by not following the advice of his elders, but he comes to appreciate and understand their intentions as he unfolds the mystery behind the killings and his larger role in an ancient secret society. Mostly, this is a story of family and community, and the love and support they provide as a boy learns how to cope in the world. Written by the same author who wrote Coraline, this book is scary and suspenseful and would be most suited for readers in grades 5 and up. Music at the beginning and between chapters is a plus in the audiobook version. The "Danse Macabre," performed by Bela Fleck and Ben Sollee, sets the tone of the story. As well, the audio is loaded with lots of special effects sounds throughout, with some singing and music at the macabre, enhancing the text. I really enjoyed the full cast performing, showcasing many accents and voices. The audiobook version also includes an author's note following the performance. This is definitely worth listening to, even if you have read the book. 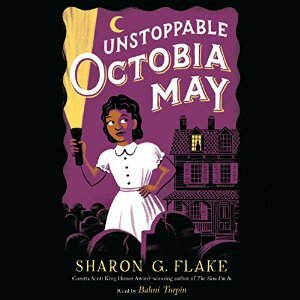 Set in 1953, during a time when negroes live under the laws of Jim Crow and little girls are expected to wear dresses, 10-year-old Octobia May, who has survived a near-death experience involving her heart, is introduced wearing pants and wanting a perm. She is a very strong female character given lots of freedom by her Aunt Shuma, with whom she has come to live in her boarding house, after convincing her family in Pittsburgh. Octobia enjoys visiting the "Before Sisters" in the cemetery and living with the older residents, hearing about their sometimes painful pasts and current events. But one boarder, Mr. Davenport is not the quiet writer he pretends to be. He sleeps all day and claims to work at the cemetery at night. Octobia knows the truth, however. He is a vampire. Because of that she carries garlic with her everywhere she goes and constantly chews on it, to the dismay of all around her, especially her best friend Jonah. She wants Jonah to help her expose the man for what he really is, since no one else believes her. She spies on Mr. Davenport all the time to get her proof, until the dreaded night when she and Jonah follow him and see him kill a woman in white by biting her neck. Her body is found in the river the next day. Even so, she still cannot convince anyone of his lies. Not even Mr. O’Malley, the town policeman. The times being what they are, and with civil rights just beginning to become a fight for negroes, the limitations for woman are highlighted as Aunt Shuma tries to acquire a bank loan to build a hotel. But she is not married and banks don’t loan money to single women. With Mr. Davenport’s assistance, she manages to get a meeting with the bank manager about a loan. The two are obviously trying to take advantage of her, but Octobia May can’t figure out how it is Mr. Davenport could have so much control over the white banker. Once Aunt Shuma realizes their scam, she kicks Mr. Davenport out of the boarding house, but not before Octobia and Jonah discover lots of jewelry and money hidden in his room. They take some of the money hidden in a bucket of sand. Unfortunately Aunt Shuma is accused of the theft of some missing jewelry and is sent to jail. To prevent being sent back home, Octobia goes on the run. She does not want to go back to Pittsburgh before she and Jonah solve the mystery behind Mr. Davenport. I enjoyed the story overall. It was historical, humorous, had believable dialect, and the mystery kept me guessing. Octobia and the rest of the characters were very likable. I liked that Mr. Davenport wasn’t a one-dimensional villan. I have a couple of complaints about the plot, but can’t really reveal those issues without giving anything away. I liked that the time period was reflected throughout and I enjoyed the ending. I would stress that this is not a vampire book. Except that Octobia is certain Mr. Davenport is a vampire, it doesn’t play a big part. It is a mystery with an historical setting. There are issues of race. There is one really sad episode that I won’t give away. Recommended for middle grade readers. I read complaints in reviews about the dialect being difficult to read, but the audio version does not have that problem and it is very easy to listen to and understand. In this regard, the audio might be better than the book. Bahni Turpin is a great narrator for this story and listeners will believe that she is Octobia May. Or Aunt Shuma. Or Policeman O'Malley with his Irish brogue. If you are looking for diversity or an African American story, this one is a great choice.